My hair has been getting longer and longer...it has a tendency of doing that for some reason. I hadn't had it cut since February when I was home. But I greatly dislike getting my hair cut. Honestly. The uncomfortable conversation, the close contact with a stranger. It is all very awkward to me. But, I knew I had to do something. Ian's barber is really nice so I asked if she does womens hair. Turns out she does. So that is where I went. The conversation was easy and my hair looks great. 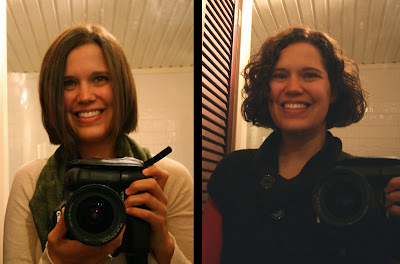 Oh, and it was so much freaking cheaper than getting it cut at a normal salon. So stellar! So hear it is, styled both straight and curly. I think I look more grown up with straight hair. Curly hair suits my personality and takes way less time to do. I think my smile looks forced in the picture with curly hair. Not sure why. Oh well...still love my shorter hair. Love the hair! I like it both ways. Curly defiantly fits your personality! ooooh, I love curly, but I really like it straight too! You have the best of both worlds. Wow! You look amazing with your hair styled EITHER way! You're so lucky. Especially lucky to have found someone you're comfortable with to do the cutting.